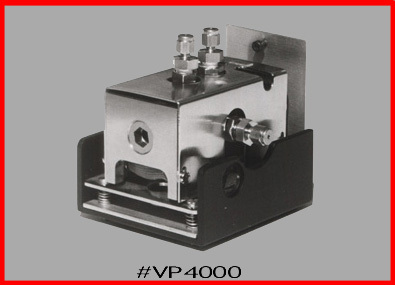 #VP4000: Variable Pathlength High Temperature / Pressure. The #VP4000 gives you the maximum flexibility in meeting the most demanding gas sampling requirements. The pressure range is from vacuum to 4000psig (273bar), temperature range from ambient to 300degC. Pathlength is stepwise variable from 0.5mm to 20mm. Four gas entry/exit ports are provided with a fully swept, flow through sample pathway. Connections are by 1/16" tubing. The gas ports are formed from the same block of material as the cell body. The result is maximum structural integrity and corrosion resistance with no welds, no brazed joints. It is also possible to alter the cell volume independently of the pathlength, should the cell volume be a critical parameter; the volume is, of course, low in all cases (maximum volume is less than 3ml at maximum pathlength). Windows are fully demountable and ZnS is the standard window material fitted for high pressure operation. Other materials may be selected as desired. The cell is precisely temperature controlled by an AABSPEC Digital Temperature Controller. The #VP4000 comes complete with an adjustable mounting system and ready to install in the standard 2" FTIR sample slide. As an option, AABSPEC Temperature Controlled Heated Transfer and Return Lines are available for connection to high temperature gas systems. The AABSPEC #VP4000 is the most versatile and powerful gas sampling facility for FTIR. For combined high temperature and high pressure operation a version is available with Aabspec patented Advanced Window Technology. Related products include the #2T-AWT.